Berkeley 48-Inch Vanity Cabinet with Mirror in Dark Chestnut If your bathroom's asking you for a facelift, the Berkeley is a worthy choice. At once elegant, classic and contemporary, the Berkeley vanity lends an air of sophistication and charm to any bathroom, from a Soho penthouse to a rustic country home. Carefully hand built to last for decades and finished in Dark Chestnut or White, this solid wood vanity has counter options to compete the timeless look. Available in multiple sizes and finishes. 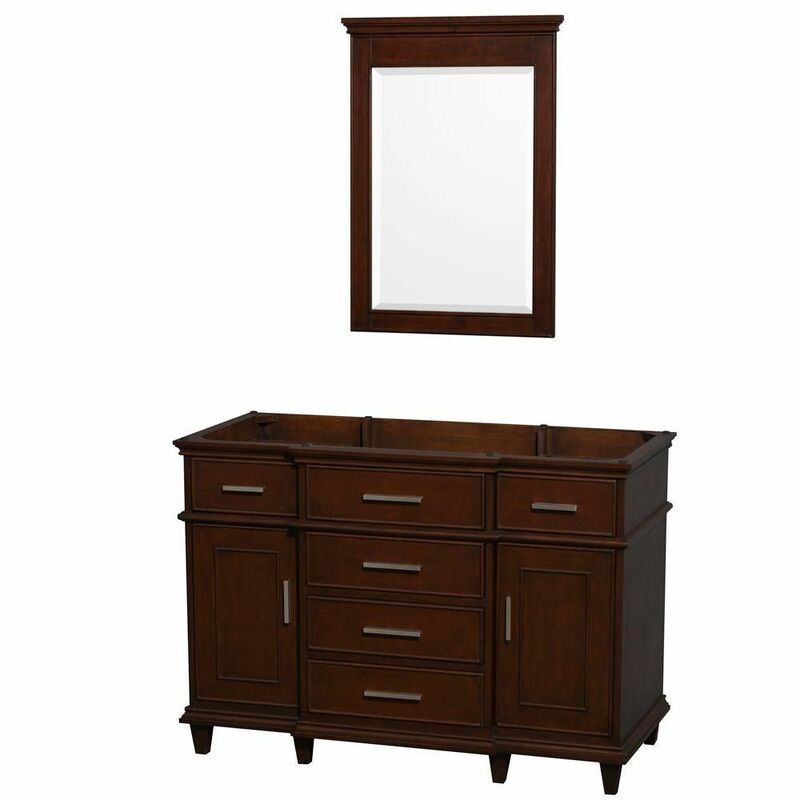 Berkeley 48-Inch Vanity Cabinet with Mirror in Dark Chestnut is rated 4.6 out of 5 by 11. Rated 2 out of 5 by Colleen from The quality on this piece is average at best. The... The quality on this piece is average at best. The drawers do not close properly and the shelves were quite damaged. The marble top is the best part of it. Rated 5 out of 5 by Candice from Great vanity! Looks beautiful!... Great vanity! Looks beautiful! Rated 5 out of 5 by Dale from This vanity is just as described. Very well made... This vanity is just as described. Very well made - looks great. Rated 4 out of 5 by Lou from We had to make some changes for it to fit... We had to make some changes for it to fit properly. One of the drawers had to be replaned in order for it to fit. Even the contractor had difficulty with this piece. It now looks very good in the powder room. Rated 5 out of 5 by Keri from Beautiful vanity I love my new vanity. I have received so many compliments on it. Rated 5 out of 5 by BT7 from This vanity is very nice. It's well constructed and looks... This vanity is very nice. It's well constructed and looks wonderful in my new bathroom. Very pleased with my purchase and would highly recommend this product to anyone looking for a high quality product at a reasonable price. Rated 5 out of 5 by JED from Was as advertised. High end look! Was as advertised. High end look!